A sixty year old woman, working at a quarry, presented with a swelling arising from her right index finger of eleven years duration. There was history of recent trauma to this finger while at work and this led to ulceration at summit of the lump. Examination revealed an ulcerated, fleshy tumour of size 9 cm × 7 cm, involving the distal two thirds of the index finger [Figure 1]. 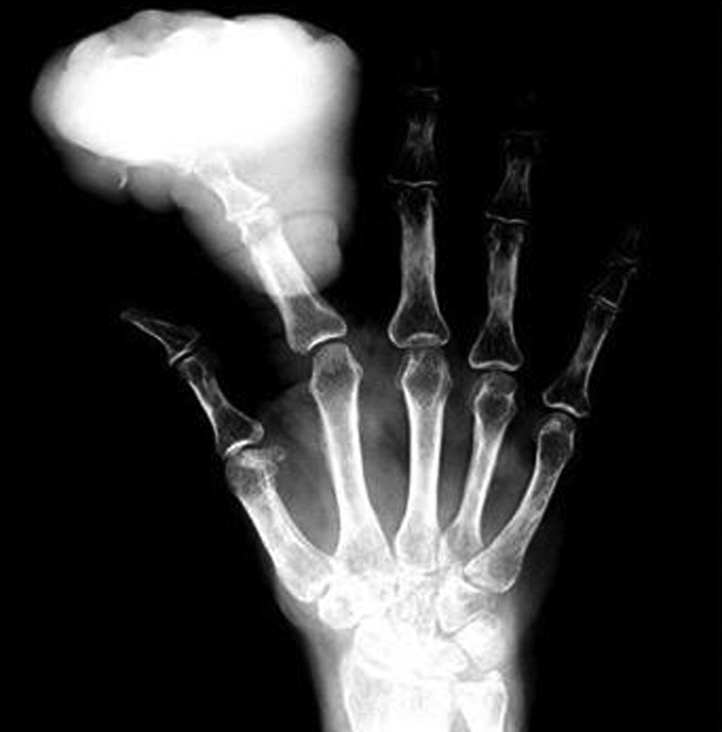 Radiography of the hand showed no bony involvement [Figure 2]. Core biopsy of the swelling revealed features of benign spindle cell tumour. A disarticulation at the second metacarpophalangeal joint was carried out as the finger was painful and non-functional. The histopathological examination showed features of desmoid tumour with proliferating stellate to spindle cells arranged in whorling patterns of fibroblast and myofibroblasts [Figure 3]. 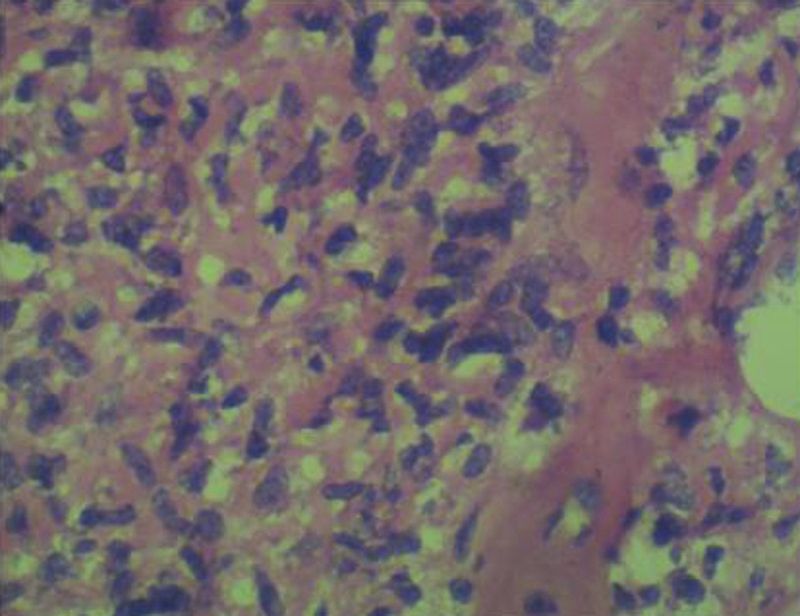 There were no nuclear atypia and hyperchromasia and the cells were strongly positive for vimentin. Currently, multidisciplinary approach is necessary for the management of desmoid fibromatosis. A surgical approach with complete excision and clear margins is the only effective method of cure, with the lowest incidence of recurrence. Amputation is reserved for refractory cases and when the extremity or the digit is non-functional or chronically painful. In conclusion, the occurrence of desmoid tumours in the limbs is extremely uncommon. They are commonly mistaken for other soft tissue tumours due their clinical or imaging findings. One should always rule out desmoid tumour for swellings arising from the extremities, especially with indolent clinical presentation. The correct diagnosis should be established based on histological confirmation. 2. Zampieri N, Cecchetto M, Zorzi MG, Pietrobelli A, Ottolenghi A, Camoglio F. An unusual case of extra-abdominal desmoid tumour. Eur J Cancer Care 2010;19:410-2. 3. Berthe JV, Loréa P, De Prez C, De Mey A. 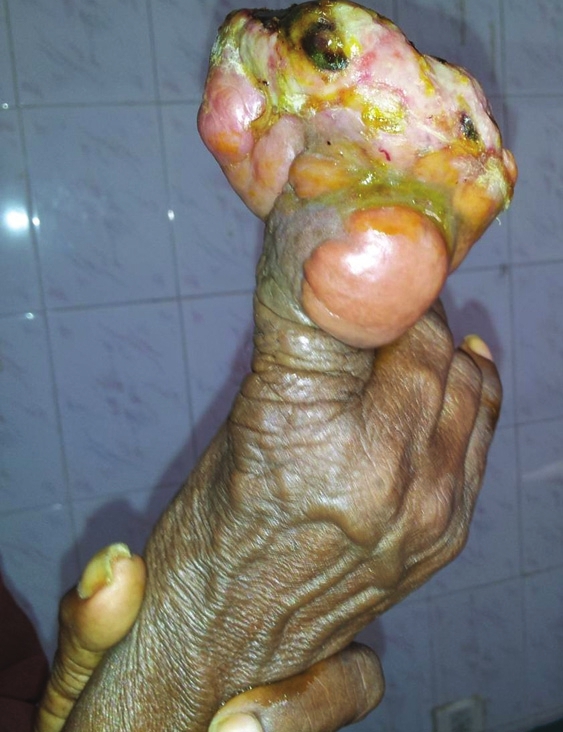 A case report of desmoid tumour of the finger.Chir Main 2003;22:312-4. 4. Deyrup AT, Tretiakova M, Montag AG. Estrogen receptor beta-expression in extra-abdominal fibromatoses: An analysis of 40 cases. Cancer 2006;106:208-13. 5. Ayala AG, Ro JY, Goepfert H, Cangir A, Khorsand J, Flake G. Desmoid fibromatosis: A clinicopathologic study of 25 children. Semin Diagn Pathol 1986;3:138-50. 6. Escobar C, Munker R, Thomas JO, Li BD, Burton GV. Update on desmoid tumours. Ann Oncol. 2012;23:562-9. 7. Wilcken N, Tattersall MH. Endocrine therapy for desmoid tumours. Cancer 1991;68:1384-8. 8. Pignatti G, Barbanti-Brodano G, Ferrari D, Gherlinzoni F, Bretoni F, Bacchini P, et al. Extra-abdominal desmoid tumour. A study of 83 cases. Clin Orthop Relat Res. 2000;375:207-13.